When did you discover anime? Share as much as you remember. Initially through Robotech on Saturday morning TV in Perth in the mid-’80s, then as part of the early members of JAFWA. What was it like to be part of the JAFWA in the early days? How often did you meet? How did you participate? In the very earliest days JAFWA met in a Church hall and screened on 3 TVs hooked together to one VCR. In the earliest days we sometimes didn’t even have fansubs, and would watch with a synopsis someone wrote up and handed out. I watched a chunk of Gall Force that way, and also Nadia: Secret of Blue Water. We met weekly, except for the first Saturday of the month, and eventually got big enough to hire a lecture theatre at the University of Western Australia. I basically went most weeks, and helped out by running the loaner library. A former JAFWA fansub in John’s collection. 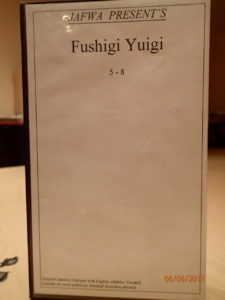 This loaner video was pulled from circulation when Fushigi Yuugi got an official US release. What appealed to you about anime when you first discovered it? Continuity: when things happened, they mattered. There wasn’t the Big Red Reset switch of Star Trek. What would you say was the most popular anime at the time? In the west? Robotech or Star Blazers. In Japan I’m not sure—Patlabor was getting started then, Dirty Pair had finished, Urusei Yatsura would probably have been close to its peak. What was it like to be a part of anime fandom at the time? Challenging. When you’re looking at a 6-12 month wait to get a 5th generation VHS fansub you learn to be patient. Could you elaborate on this entire VHS situation? Was a 5th gen VHS tape still watchable? Did you trade tapes? Once there were enough fansubs coming through, and people wanted to catch up on previously screened material, JAFWA started running a loaner library of fansubs using converted videos. Australia uses the PAL system, and most of the fansub supply coming through was on NTSC (Never Twice Same Colour). We needed to do the conversions because NTSC-capable VCRs were pretty rare in Australia in the early 90s, and pretty pricey. I think mine cost around $1,000 then. After that I’d run a simple card system to check the copies in and out. I did a lot of the copies/conversions for these—I had custody of an NTSC-PAL converter and a couple of VCRs that I would use to run yet another generation of copy, and then another member would print labels for the boxes. We’d pull the tapes from circulation once a title got licensed, we were pretty big on encouraging the commercial market and stopping fansub distribution at that point. So I ended up with a lot of the old loaner library tapes, and I’ve attached a couple of quick images to show how we were presenting them. A warning on a JAFWA fansub. As for whether the copies were watchable, well, that was debatable. 😄 It did tend to encourage support for the commercial market even at the brutal prices of $60 US for a couple of episodes, and I even ended up buying commercial laser discs long before I had a player. A lot of local fans were in the same boat, so that converter I mentioned earlier got a fairly heavy workout making PAL copies of NTSC commercial tapes for local playback. There was some tape trading going on, but I wasn’t involved in that, I was mostly supporting the committee in other ways. Was the Internet a part of fandom at the time? If yes, how? If no, how did you connect with other fans? Not really. A couple of the JAFWA founders went to AnimeCon ’91 and established fan sub group connections but that was most of it. How big was AnimeCon ’91? I’m honestly not sure, but I vaguely recall it being well over a 1,000 attendees. It did have a really cool opening video set to Dvorak’s 9th Symphony “From the New World” and it’s been one of my favourite pieces ever since. How big was SwanCon back then? What kinds of activities were there? SwanCon’s been pretty stable in size over the years, figure on attendance in the 2-300 range each year. It can get bigger if we get a major name guest like Terry Pratchett or Neil Gaiman, but that’s where it usually sits. SwanCon was a pretty strict literary SF convention in the mid-80s when I started going, but started evolving after that. By the 90s there was a fairly decent gaming stream (that I ran in 1991 on the SwanCon 16 committee), and it started branching out into other media. This included running a video stream that ran 24 hours at some conventions. This introduced a lot of people to anime, particularly the standards like Ranma ½ or Vampire Princess Miyu. At a couple of these the Video Committee would each take a midnight to dawn slot to program as they saw fit. I did “Not all dubs are Evil” that way one year, which must have been in the mid to late 90s since I would have relied on El Hazard for a lot of that. Meanwhile the regular SF con activities of panel discussions, banquets, and masquerades continued on their merry way. These days I mostly go to SwanCon to catch up with old friends and hang out in the gaming room, the video streams died off a while back because of copyright issues. I found your blog and it said you originally blogged on LiveJournal. Were you part of the anime fan community on LJ? I actually didn’t start blogging because of anime at all—it was initially a journal to keep track of a cycling trip from Adelaide to Melbourne along the Great Ocean Road. So I wasn’t really part of the anime fan community on LJ at all. In fact it took a month and a half for my first ever anime review—Kamui no Ken—to appear on the blog. For you, what’s the biggest contrast between fandom then and now? Obviously the instant gratification of Crunchyroll is the biggest change, noting that CR doesn’t get Australian licenses for everything, and that AnimeLab doesn’t always fill the gaps. I’ve been hearing interesting things about Re:CREATORS, but it’s not streaming anywhere in Australia as far as I can tell, so I’m kind of out of luck there. On a secondary level is the still fairly successful DVD/BD markets with Australia having no less than three publishers going: Madman, Hanabee, Siren. Between the two I mostly don’t bother with fansubs anymore, and certainly don’t download any. About the only exceptions are those hard to get shows that I might pick up occasionally when I visit a friend in Perth. I try to buy local, but there are still times when I need to order overseas. I’m still dithering over it, but I’ll probably have to order the BDs for the Patlabor TV series in from the US because the market here isn’t big enough for Madman to do them (they did DVDs but I want BDs if I can get them). And, yes, I have a multiregion DVD/BD player, that was an essential requirement when I upgraded from the creaky old DVD/LD player (which I need to get repaired again). Another difference is that I’m probably more involved in pure anime fandom now than I have been in a while. I’m only at the edges of Anitwitter but I’m doing panels regularly at GammaCon in Canberra, did a couple at SwanCon this year, and I’m doing one at Continuum this month. John can be reached on Twitter. When did you discover anime? Share as much as you remember. When I was eight years old, I lived in a house that was pretty huge and in the countryside. It was very strange, with different family members living at far ends of the building, so my mother would sleep with me in my room and we’d watch TV together in the dark, with light-loving moths and bugs fluttering around the CRT [a type of older TV]. Back in those days, SBS Australia, the multi-cultural government-funded channel, aired Evangelion. My mum, who is admittedly a bit strange, watched it every Saturday. I would have been asleep at that point, but I was of course lying on my mattress, eyes glued to the screen. Naturally I didn’t understand much of it, but several specific scenes and images stuck in my head. The surprise when Unit 01 moves, the strange Angel that invaded the computer systems. The giant eyes in the sky, the shadow that eats the city. Rei talking to herself. The sound of the automatic system as it plunges Eva 01’s arms into the body of the berserk Unit. Asuka’s ride going under Kaworu’s control, and of course, congratulations. I have vivid mental pictures of the scenes, the structures, the gigantic machines themselves. Then, the show was gone, my life took a turn for the worse, and I never got into anime beyond kid stuff like Pokemon until the 2000s. But those robots. Those Eva units will always be beautiful to me, and they coloured me as a mecha fan even without knowing anime as a medium. What appealed to you about anime when you first discovered it? I think the directorial approach. If you look at western cartoons, they’re very much done in a “flatter” style. Meanwhile anime is constructed like it’s a 3D set. It makes the show feel like an actual place rather than, say, a comic book or a drawing. Naturally not all of either medium is like that but that’s what originally struck me with Eva and the reason I came back into anime. What would you say was the most popular anime at the time? As a child it changed over the years, but we got Pokemon, Digimon and, strangely, a straight Animax dub of Cardcaptor Sakura I was rather enamored with. All the kids liked Dragon Ball Z, but I wasn’t into it. I remember the merchandise littering the schools and sports centers though. When I was forced to live in China I encountered different anime series, where dubs of Nadia [the Secret of Blue Water] rubbed shoulders with Jura-Tripper and Hikarian. I quite liked those, they were very different from what I saw in the west. I didn’t really cotton onto their Japanese origins though. What was it like to be a part of anime fandom at the time? There really wasn’t one in Australia I could find. I lived in a place that could best be described as plains of sugar cane and bug-infested forest ringing spread-out future development zones and tourist-laden beaches. My mother would rent VHS tapes of “cartoons” at the video rental store, so I found the anime section for my Sakura Wars video and Slayers occasionally, but they were just movies to me. Why did you take a break from anime? What brought you back? I kind of didn’t have any strong way to keep up with it, I guess? The way my life twisted around was that I ended up living in foreign countries and the television was always useless, there was no time to establish broadband so no downloading or fansubs, and when I made it back to my home in Australia we had what was colloquially known as “third world internet” for a long time. Television took ages to even cycle in American cartoons, so my focus was on things I could actually get: videogames. Naturally I encountered anime-styled characters and Japanese games and became aware of it, but it was only really when I started searching for gamers on the internet that I became aware of people talking about it. A few arguments later, I had broadband, and watching Lucky Star on youtube after seeing someone’s slow-loading forum banner gif of the intro. The limit was 12GB so naturally I burned that out in a week. What was the first show’s fandom you really invested yourself in? I mean, consuming/creating fanworks, buying merch, etc. Well I found a Lucky Star imageboard, but I just read the doujins [doujinshi] posted as I sampled other shows. The first time I REALLY got into something was Gundam 00, which led to the rest of the franchise and me buying model kits and even DVDs. I joined the forums over at MAHQ, realized I hated these people, and instead followed the show from Random Curiosity instead. There were fansub wars, arguments in the comments, and I fell hard into the drama. I eventually found other places as I watched through Gundam, a lot of them actually small groups of specialty fans on unrelated forums for toys or mecha or sci-fi. I didn’t really get the fujoshi thing until I was in the middle of Gundam Wing though, and it was like a whole new world was opened up to me. Not that I’m big on that sort of thing but I can enjoy it as a part of culture. I think it’s actually necessary for modern Gundam fans to get some joy out of flirty gay-tinged stuff because the nasty “fans” won’t let you enjoy anything else. How did you begin connecting with other fans? Mostly internet forums. I’d just play around in comment sections on fansub sites and blogs. Instead I connected with people on forums over other interests like games or purely on the basis of friendship born from familiarity, then get them into anime by bullying them into watching it. We’d be relatively insulated on our opinions, then the inevitable march of social media and internet memes dragged into the gravitational pull of places like 4Chan and much later Twitter, where I’m at my most comfortable. What’s the biggest contrast between anime fandom when you got into it and now? Probably the fansub wars. Back then there was constant drama, name-calling, nitpicking and bullying. With Lucky Star it was A.F.K. or Guerrand, with Gundam 00 it was Nyoro~n or Conclave Mendoi [all names of fansub groups]. The drama and possessiveness was amazing and half the people seemed to care more about the subs than the show. These days proper simulcasting has completely destroyed most of that, and the only people who fansub are ones who really want to do a specific show out of interest. It’s a lot more peaceful, though naturally there’s still plenty of bastards who rant and complain about the lightning-fast subtitles they get (sometimes for free, not like piracy has gone anywhere), forgetting when it took days or weeks to get a show subtitled. Keeping everyone happy is impossible. Hag can be reached on Twitter.